This paper examine whether supply chain management (SCM) literature prescriptions yield better performance as advocated. Companies try to benefit from theoretical knowledge to improve their performance and thus enhance their possibilities to survive and prosper. To follow theoretical knowledge is not easy, since it is general in nature and supposed to be valid in multiple (all) cases. To be useful, however, it has to be adjusted to the actual, context-specific situation. This paper focuses on SCM prescriptions in existing literature, and examines them empirically in two supply chains in the Norwegian seafood industry, where uncertainty is highly present. The two chains differ substantially regarding the transformation and flow of goods and information. One chain deviates substantially from literature prescriptions. Opposite to expectations, performance for this supply chain is better than for the other chain which to a much larger extent follow literature prescriptions. The findings are discussed, and implications for theory and management highlighted. Det er vanskelig å etterleve teorier, siden de av natur er generelle og ansett å være gyldige i mange, eller alle, tilfeller. For å øke teoriers anvendbarhet må de justeres til den aktuelle, kontekstspesifikke situasjon. I denne artikkelen belyses hvorvidt sentrale anbefalinger fra litteratur om forsyningskjedeledelse (SCM) kaster av seg. I artikkelen undersøkes to forsyningskjeder i norsk sjømatnæring karakterisert av stor usikkerhet i omgivelsene. De to forsyningskjedene – henholdsvis filet og tørrfisk fra torsk – er svært forskjellige med tanke på prosessering, vare- og informasjonsflyt. Tørrfiskkjeden avviker vesentlig fra SCM-litteraturens anbefalinger. Det til tross, så scorer den bedre på sentrale prestasjonsmål enn filetkjeden, som i større grad er i overensstemmelse med anbefalingene. Avslutningsvis diskuterer vi funnene våre og mulige implikasjoner for teori og ledelse. This paper addresses whether prescriptions from the supply chain management (SCM) literature yield better performance and enhance competitive advantage, as advocated by its proponents (e.g., Araujo et al., 1999; Dyer & Singh, 1998; Lee, 2002). This is an important question because companies try to benefit from theoretical knowledge to improve their performance. We focus on established prescriptions for supply chain management (SCM) and examine whether these are applied in practice – and to what extent they improve performance. Two different supply chains operating in the same industry characterized by high levels of supply uncertainty is the empirical context for our study. In the next section, we review selected parts of the supply chain management literature of particular importance for our study. More specifically, we address how uncertainty is treated within SCM as well as within other management theories. We do so because SCM challenges are the greatest when supply uncertainty is substantial. We then present our research method and empirical setting, before a more detailed presentation of the two supply chains in question is given. Then we map how the two supply chains adhere to central SCM-criteria, and report findings. Finally, we summarize, conclude and discuss implications. «…the integration of business processes from end users through original suppliers that provides products, services and information that add value to customers and stakeholders» (Lambert & Cooper, 2000: 66). This corresponds to the idea of the value system (Porter, 1985), where the traditional view of the company as a single entity is insufficient to explain competitive advantages. Rather, the focus should be on systems of companies conducting subsequent activities in order to fulfil consumers’ demands – a predominant downstream and market oriented view which has been criticised for neglecting the upstream facets of the chain (Erevelles & Stevenson, 2006). According to Kopczak & Johnson (2003), the fundamental business problem from the viewpoint of the entire supply chain is to supply products that meet demand in a complex and uncertain world. SCM has adopted an efficiency view, where the primary goal is to increase productivity and reduce costs (Chandra & Kumar, 2000). A central theme emphasized in the SCM literature is that if every link in the supply chain focuses on a set of corresponding and compatible goals, and openly shares information, redundant and duplicated efforts can be reduced (Spekman et al., 1998). Prescriptions emphasize the need to manage relationships, including information and material flows across companies, to cut costs and enhance the flow of goods (Hutt & Speh, 2004) in order to increase customer satisfaction. Within this holistic perspective, the entity is presumed to be larger than the sum of its parts. The lion’s share of empirical studies on SCM is conducted in environments where the supply situation is relatively stable. As uncertainty increases, challenges in managing the supply chain also increase, and coordinating tasks becomes more complex. Some tasks are, however, more important than others for supply chain performance, and therefore more prominent in theoretical discussions. Table 1 presents the fundamental characteristics of the ideally managed supply chain, according to Storey et al. (2006)’1′. «organizations will seek to buffer environmental influences surrounding their technical cores with input and output components. To maximize productivity of a manufacturing technology, the technical core ‘2’ must be able to operate as if the market will absorb the single kind of output at a continuous rate, and as if inputs flowed continuously, at a steady rate and with specified quality. Conceivably, both sets of conditions could occur; realistically they do not. But organizations reveal a variety of devices for approximating these ‘as if’ assumptions, with input and output components meeting fluctuating environments and converting them into steady conditions for the technical core.» (Thompson 1967: 20). The items in Table 1 represent ways to isolate the supply chain’s technical cores from environmental uncertainty. Under fully predictable supply and demand conditions, implementing such principles would be redundant, since production is levelled according to accurate forecasts. SCM has been criticized for its metaphoric nature and lack of guidelines for practical applications. This makes the correspondence between theoretical prescriptions and real-life approaches hard to capture, and proper operationalization of theoretical concepts is necessary. In the below sections, the challenges to SCM imposed by uncertainty are addressed. But first, some theoretical approaches to uncertainty in the management literature are presented. Emphasis is put on the organizational choice between market and hierarchy, between which supply chains reside (Ketchen & Giunipero, 2004). Uncertainty is the discrepancy between current and needed information in order to carry out necessary duties (Galbraith, 1973), and — according to Coase (1937) — without uncertainty, firms would probably not exist. Uncertainty refers to environmental disturbances of a stochastic nature, with which a firm is confronted throughout the life-span of a contract or a bilateral exchange relationship (Mahoney, 1992). Uncertainty can take many forms. Sutcliffe & Zaheer (1998) distinguish between primary uncertainty (arising from exogenous sources), competitive uncertainty (actions from actual or potential competitors) and supplier uncertainty (strategic action from exchange partner firm). In the face of uncertainty, organizations can either adapt to it or take proactive counteraction to reduce it. «…the methods of competitively organising that come closest to the concept of supply chain management». Hence, an equality sign between the two and SCM is drawn. «…asset specificity (especially) and information impactedness, opportunism and bounded rationality, uncertainty and small numbers bargaining, together with frequency» (Williamson, 1983). When transaction costs are high (i.e. when exchanges recur frequently, require specific investments, potential exchange partners are few, and/or outcomes are highly uncertain), they are best performed within a hierarchy (within the firm), as this means information transfer is eased, opportunism is discouraged and conflicts can be resolved by authority. Uncertainty in the transaction environment complicates contractual governance (i.e. market exchanges), because managers are boundedly rational. Hence, according to TCE, uncertainty should lead to higher levels of vertical integration, or SCM (Ellram, 1991). «…to shield the firm, to the maximum extent legally possible, from competitive forces» (Teece 1984: 4). In IO, industry — not transactions — is the unit of analysis; industry characteristics determine the sources of profitability and the company’s position in the industry (i.e. the structure-conduct-performance paradigm). Porter (1980) turns this focus around, from what imperfect competitors should not do, to what the smart manager should do, in order to curtail competitive rivalry, by low cost, differentiation or market power advantage. According to Ellram (1991), vertical integration can be viewed as an alternative to SCM, as it attempts to manage channel efficiency. Within this stream of research, uncertainty influences the make-or-buy decision (or SCM level) in different ways, and recommendations are unambiguous. First, uncertainty can be used strategically by industry incumbents, to create entry barriers for potential entrants lacking established market knowledge (Sheperd, 1997). With input supply uncertainty regarding price and quality, upstream vertical integration can help the company forecast input prices and establish the best input mix. With uncertainty regarding demand, less vertical integration is preferable. Harrigan (1983) recommends low levels of vertical integration in the face of demand uncertainty or technological uncertainty. Finally, RBV literature accentuates resource heterogeneity and immobility (i.e. input market imperfections) as the sources of competitive advantages for firms, opposite to the IO perspective where these are accrued through product market imperfections (Barney, 1986; Wernerfelt, 1984). Some of the resources held by firms are either costly to duplicate or inelastic in supply. Exploiting and internalizing such resources can bring about economic rents above average. Vertical integration, or the way companies organize their supply chain, can be a way of creating valuable and rare resource combinations that are difficult to imitate. No rule of thumb exists for when to integrate vertically, but efficient company boundaries should follow a comparison of the relative strength of internal and external capabilities (Langlois, 1997). Where TCE explains the existence of the firm by analysing market failure and its influence on efficiency (and thereby also managerial hierarchy), RBV tries to answer why firms differ by underlining the smart response to market failure. Also, in this approach, uncertainty has no clear effect on vertical integration. Barney (2002) argues that when uncertainty is associated with unanticipated sources of opportunism in an exchange, vertical integration is an appropriate way to avoid it. If uncertainty is associated with the future value of an investment, flexibility becomes more important, and less hierarchical governance is preferable. Market uncertainty makes it difficult to decide which capabilities will lead to longterm success. Consequently, flexibility should be nurtured in order to enable quick responses in developing the necessary capabilities once uncertainty has been resolved. Management theory offers a large number of recommendations regarding the best strategic countermeasures companies have at their disposal in the presence of uncertainty in their surroundings. The nature of the uncertainty determines which countermeasure to employ, but even within the same perspective, advices seem to differ. Below, the treatment of uncertainty within SCM is briefly presented. In the SCM literature, uncertainty is dealt with in different ways. At the core of logistics is the imperative that all supply chain processes (from raw material to the customer) should add value to the product. If added resources do not contribute to enhance the end product’s value, it is waste, and should be eliminated. In a «one sold, one made» perspective, inventories are the most obvious case of waste. When embedded in an uncertain environment, uncertainty will propagate through the entire supply chain system and complicate SCM (Davis, 1993). Uncertainties, occurring between stages in the chain, are most often assured against by using inventories, i.e. «protection against life in an uncertain world» (ibid., p. 38), or providing excess capacity (van der Vorst et al., 1998). Buffers, in time, capacity or inventory—to cope with uncertainty—lead to inefficient processing and non-value activities (van der Vorst & Beulens, 2002). One of the most influential approaches to uncertainty in the SCM literature comes from Fisher (1997). In his framework, the product type is crucial for the choice of supply chain, and the variation in level of uncertainty surrounding the demand for the product yields different supply chain design. He distinguishes between «functional» and «innovative» products: By «functional», Fisher means products that satisfy basic needs, have long life cycles and enjoy a stable, predictable demand, while «innovative» products have short life cycles, exhibit great product variety, and meet unstable, unpredictable demand in their markets. According to Fisher, supply chains should focus on efficiency to minimize the costs of functional products. For innovative products, supply chains should be designed for responsiveness to avoid expensive market mismatches. Fisher’s emphasis on market respons¬iveness and physical efficiency is similar to Christopher’s (2000) distinction between the leanness and agility: where leanness suits high volumes, homogenous products with predictable demand like commodities, agility suits low volumes, differentiated products with high demand variability. Stable demand allows for a focus on efficiency and low cost. Volatility in demand for innovative products entails a greater risk on the part of producers in terms of shortage or excess supply. This risk is escalated by shorter product life cycles, which favour a market-responsive supply chain. «A ‘stable’ supply process is one where the manufacturing process and the underlying technology are mature and the supply base is well established. An ‘evolving’ supply process is where the manufacturing process and the underlying technology are still under early development and are rapidly changing, and as a result the supply base may be limited in both size and experience.» (p. 107). Lee acknowledges that food products might have a stable demand but a highly variable supply side, as quantity and quality are dependent on weather conditions: a situation suitable for our setting. Based on product type (functional or innovative) and supply conditions (stable or evolving), he prescribes four distinct types of supply chain strategies for reducing uncertainties on the supply and/or demand side. One of these strategies is a risk hedging strategy, appropriate for functional products in evolving supply processes. Inventories are then pooled and resources shared among supply chain participants, which shields individual actors against the risks associated with supply disruptions by sharing safety stocks with other actors. Inventory pools decouple the supply chain effectively, and, for downstream companies, multiple supply bases safeguard backup supply. Mason-Jones et al. (2000) combine leanness and agility in the same supply chain, as an equivalent, yet opposite, approach. In their hybrid strategy, «leanness» is retained upstream of a determined decoupling point ‘4’ , while processes downstream of this point focus on flexibility (agility). This strategy is in their view better able to ensure best practice SCM when early supply chain stages are relatively stable, while end-markets are calling for increased attention. Supply chain managers are vulnerable to many different forms of uncertainty, and the need for SCM is related to the development of the competitive business landscape in the late 1980s and early 1990s (see e.g. Ellram, 1991; Hutt & Speh, 2004). Globalization, market deregulation and technological progress have created greater competitive pressure, both within and between nations. However, no general SCM prescriptions exist for how to diagnose and take action against contingencies, and managers’ perceptions of uncertainties might vary significantly. In the following section, we present some specific contingencies in our chosen setting, which create uncertainty and deserve managers’ attention when supply is virtually stochastic. This section describes how we examine our research question empirically, i.e. to which degree supply chains in our industry subscribe to SCM practices, and if they reap the prescribed benefits therefrom. The industry consists of approx. 500 companies in 11 different industry segments — defined by the main products they bring to the market. We focus on two distinct supply chains, the stock¬fish segment and the whitefish fillet segment. Common to both supply chains are substantial uncertainty related to input supply. The two different supply chains was chose for this study because they cope with supply uncertainty in different ways. Thus, we obtain variation on how these chains are managed at the same time as undesired variations in industry conditions is kept at a minimum. In this way, «industry effects» caused by cross-industry differences are unlikely to influence the results. and whether SCs by their SCM practice achieves a competitive advantage. We have concentrated on the two supply chains to capture how companies make different adaptations in this industry environment. Both segments share the same supply base, and in many instances they are served by the same raw material vendors: fishing vessels of different sizes using different gears, from small coastal vessels fishing with hand lines to large ocean trawlers. Different vessels catch different types of fish, and different gears usually catch fish of different sizes. The quality of the catch varies with season, gear and onboard handling. Once quality losses occur, it cannot be recovered at later stages in the supply chain. The most important whitefish species are cod, haddock and saithe. The Northeast Arctic cod is the most important species, for fishermen as well as processors, both in terms of catch value and volume. Biological features, such as migration patterns, weather conditions and abundancy, create a seasonal supply with a high degree of variability. For cod, this presents itself in the seasonality of the two main fisheries. First, from their normal habitat in the Barents Sea, mature cod migrate to the coast of Northern Norway (mainly Lofoten) to spawn in the period between February and April. Second, younger year classes of cod — feeding on capelin — follow the capelin on its way to spawn along the coast of Finnmark in the period between March and May. These periods are the two main seasons for coastal vessels. Where vessels in the Lofoten fishery bring ashore large-sized cod of great quality and value, the landings from the Finnmark fishery bring cod that is smaller in size, with potential quality weaknesses. Larger vessels (like trawlers) are less dependent on weather in their operation, usually fish far off shore and catch fish of smaller size, with less seasonal variation. Fishing is a highly regulated activity, and authorities impose both input and output regulations on the fishing industry. Following advice from the International Council for the Exploration of the Sea (ICES) and bi- and multilateral negotiations, the Government allocates Norwegian quotas to fishermen. In addition, the value chain link between the fishing and fish processing industries in Norway is highly regulated. One example is that only registered fishermen are allowed to own and operate registered fishing vessels, leaving fish processing companies excluded from upstream vertical integration. However, some exemptions have been granted (Hermansen et al., 2012), and today, most cod trawlers are owned by whitefish filleting companies. Integration towards other parts of the fishing fleet is virtually non-existent. In addition, sales organizations collectively owned by fishermen, have legislative monopoly rights to attend all first-hand sales of fish. These sales organizations can also unilaterally determine minimum prices for fish, though in practice, prices are determined following negotiations with fish processing company associations. Furthermore, fish processing companies are prevented from purchasing the ‘most desirable’ parts of the catch from vessels, and must buy the whole catch from each vessel. Fish auctions are an exception, where fish frozen at sea is sold in homogeneous batches regarding species and fish sizes. Usually, fishermen also catch several bycatch species, even when targeting only one. becomes an ideal, far from the reality perceived by managers of fish processing companies. Rather, in supply chains for fresh food, as in the present case, adequate supply is seldom provided by standalone companies, due to perishability and shelf life constraints (van der Vorst & Beulens, 2002). Perishability creates uncertainty in food supply chains (Georgiadis et al., 2005; Hobbs & Young, 2000; van der Vorst et al., 2001), and fish is a highly perishable asset. The species available in Norway, where the natural habitats of the fish entail sea temperatures well below 10°C, are even more perishable than agri-cultural products, because the natural bacterial flora of these fish is not curtailed by product cooling in the range of 2–6°C, which is the regular temperature in retailer display counters for fresh products. Suppliers counter this uncertainty by locating a buyer fast, as the fish cannot endure long breaks on its journey to the market. In many cases, warehousing products hoping for improved market possibilities is not an option for suppliers. No doubt, managers of fish processing companies struggle against the quantity, quality and timing of supply on a daily basis. The problems are, however, neither due to manufacturing or logistical problems (in a narrow sense) nor the unresponsiveness or opportunistic behaviour of suppliers. Without rejecting these arguments as uncertainty sources, the major cause of uncertainty demanding manager attention in this industry is the harvesting and supply of a biological resource, where variations in weather, abundancy and composition makes timing, quality and quantity of supply virtually stochastic. These sources of uncertainty can only to a limited degree be remedied by strategic purchasing, long-term relationships, intercompany communication, cross-organizational teams and supplier integration (Paulraj & Chen, 2007). The only way to reduce this kind of uncertainty through SCM is to increase the exchange of information up- and downstream the chain, and by adopting safeguarding procedures. «…transactions follow a repetitive pattern, with both exporters and importers having their regular trading partners» (Dulsrud & Grønhaug, 2007: 11). Since few quality standards exist for these products and product quality is dependent on mode of transport, the exporter usually has more information regarding product conditions than the importer, who often is unable to ascertain product quality until after delivery. In this context, trust between sellers and buyers is crucial; written documentation is scarce and few transactions follow formal contracts. Reneging is rare, but would have immense financial consequences for the seller, as would complaints and returns. Unlike the organization within the agri-food business in Norway (where farmers hold proprietary interests in the entire chain, products are sold almost exclusively on the domestic market only and prices are set unilaterally in cooperation with the government), fishermen and fish processors have — despite their mutual dependency — opposing interests when it comes to the price of the raw material: what is the sole source of income for fishermen is the highest cost component for fish processors, who compete in an international market place. Consequently, the strategic uncertainty is considerably higher in fish supply chains. Fish product supply chains are characterized as push, rather than pull, systems. Traditionally, the Norwegian fisheries industry is characterized as volume-oriented, where target figures are related to production yields, batch sizes, and inventories rather than balancing production with consumer demands. The development in food supply chains in recent decades has been one where power has shifted from manufacturers to groups of retailers. This has, in turn, rendered food products as «…functional products with volatile and unpredictable demand», as «retailers set the prices and demand frequent and responsive deliveries on short notice» (van der Vorst et al., 2001: 74). In our analysis, the total supply chain is taken into account, but the emphasis is placed on the supply side — an environment shared by almost all aspects of the Norwegian fish processing industry. This is also the business area that deserves the most attention from managers in this industry (Ottesen & Grønhaug, 2002; 2003), where purchasing is not only an integral part of running the company (Gadde & Håkansson, 2001) but one of the most important ones. Fish supply chains have distinct features in common with other food supply chains, like the perishability of products, the seasonality of supply and, in some cases, the need for an uninterrupted chilling/freezing chain from harvest/processing to the retailer (asset specificity). However, in some respects, the seafood supply chain (based on wild fish, as opposed to aquaculture) differs considerably from other food supply chains — mainly due to the lack of control upstream in the chain. Harvesting is subject to great uncertainty created by nature — particularly weather conditions and biological factors. But where the farmer can sow his cultivated soil in the spring and, with a relatively high degree of certainty, plan his harvest in the summer/autumn, the fisherman has no influence on the harvest in the season to come, other than to keep his gear and vessel in good condition and being ready to put in the effort necessary when possibilities turn up. If measured from spawning to catch, production cycles are much longer in fisheries than in agriculture. Furthermore, it is out of harvesters’ control, which makes it difficult to implement health and safety, traceability and animal welfare standards. Also, the fluctuations experienced in fisheries are higher than those seen in agriculture ‘5’. Both chains deal with regional and seasonal variations in supply, but there is a greater level of uncertainty regarding the fish harvest, because abundancy and availability plays a greater role. In fact, typically 25 percent of the cod is landed in March alone, and 50–60 percent is landed in in the period between February and April every year, greatly affecting the industry’s capacity utilization. Above, we have argued that the setting under scrutiny is one where considerable uncertainty is present. In the next section, we will address the challenges this creates for supply chain management in this business environment, and how two different supply chains perform – using different strategies in order to survive and prosper. The two selected supply chains in the Norwegian fish processing industry are the stockfish and the whitefish fillet supply chains. Our predominant focus on the up-stream part of the supply chain contributes to level the prevailing down-stream orientation in SCM literature (Erevelles & Stevenson, 2006). Common to both supply chains are the supply challenges noted above, and they represent different approaches to the uncertainty in the supply environment. Both chains are defined by the main product they bring to market, as recommended by New (1997). In the view of central SCM practices, they are dissimilar in many respects, as will be made clear from the discussion to follow. First, however, the two seafood supply chains are briefly described with respect to the main transformation and logistic processes ‘6’ that take place from raw material to consumable products. Within the fish processing industry, we find 26 companies who mainly produce stockfish, all located in Lofoten, with a total turnover of NOK 651 million and an employment of approx. 194 man-years in 2009. Drying is the oldest kind of fish preservation in Norway, with traditions going back as far as the Viking era, and stockfish is probably the oldest Norwegian export product. The largest market for stockfish is Italy, who receives the best, most valuable stockfish, made from cod. Stockfish is also exported to other nations, especially Nigeria and Croatia. Here, the stockfish supply channel is described for export to Italy, the single most important market, which takes about 85 percent of the Lofoten-dried cod. The fish is caught outside Lofoten, mainly with size-selective gears (e.g. gillnets), in March. The fish is normally stored onboard no longer than 6–10 hours before it is landed (headed and gutted) to processors. There, the fish is rinsed, the fish is tied together in pairs by the tails, and then hung on drying racks, where it is left to dry from early March until mid-June, when it is taken inside for subsequent drying. From August, professional graders sort the fish into 17 different qualities, before it is pressed together in batches of 25–50 kilos and sewn into gunnysacks, ready for export. Most of the production is sold during the autumn. Some is also sold in the spring, but the end-product can be stored for up to a year. When exporting the stockfish, most producers use agents as middlemen, but some export on their own and represent themselves in meetings with importers ‘7’. Stockfish is a very expensive product and possible deterioration is often not discovered until the product reaches the «soaker». There, the fish is soaked in water for approx. 10 days, until it reaches about the same weight as before drying. After this, it is sent to retailers or restaurants. Italy is actually comprised of five different regional markets, with regional variations in how stockfish is preferred and prepared. In 2009, there were 9 active whitefish filleting processors in Norway, all but one located in Northern Norway. They had a turnover of NOK 1,537 million and an employment equivalent to 720 man-years. In 1999, the number of companies was 19, turnover NOK 2,038 million and employment at 1,530 man-years. This industry segment has played an immense role as the main employer, and/or sole recipient of fish, in many coastal communities. Due to their importance as local employers and their need for raw material input, these companies have often been granted permission to own large freshfish trawlers that could ensure a continuous supply. Even though many of these companies have a trawler fleet serving them with much of their needed input, they also purchase fish from other, smaller vessels. We concentrate our discussion on the most important product from this supply chain: the 400-gram box of frozen cod fillets, exported all over Europe. Today, the 400-gram box contains loin-free fillets, tails and bellies ‘8’ , which have completed the manufacturing process no more than two days after landing. Fresh fish trawlers land their catch after maximum five days at sea, and after the unloading process, which takes 4-5 hours, the fish is sorted according to size and freshness (time elapsed since catch). After mechanically filleting and skinning the fish, the remaining blood, innards, skin and bone are manually removed. The fish is then packed and frozen in boxes of 10 in a couple of hours, and stored locally. Sale is normally prearranged. After a couple of days in local warehouses, refrigerated transport takes the fish to the intermediate warehouses of large food retail chains (domestic or foreign), after which it finds its way to retailers. Technology and structural changes in the fishing industry have, however, produced an alternative supply chain structure for this industry. Trawlers with onboard freezing equipment, make six weeks fishing trips and land cod, frozen at sea, directly to processors or to freezing storage plants. From storage plants, batches of fish, sorted by species and size, are auctioned off to the best-paying customers. With this new supply chain actor, the first-hand market for fish has gone global. Landed frozen fish is thawed and manufactured defrosted, a production process lasting only one day longer than what is the case for fresh fish. In summary, processing companies in both supply chains use multiple sourcing. However, as both supply chains are push-oriented, the choice of suppliers is not restricted to price, quality and supplier service criteria. Processing firms are said to prefer volume over quality when «selecting» suppliers, in order to reduce transaction costs due to a substantial overcapacity in the industry and floor prices set by the Fishermen’s Sales Organization. In most cases, however, it is the supplier who chooses whom to sell to, and not vice versa. Landing place choices are based on the prices and the service offered by the buyer, and mobility restrictions of the vessel and the condition of the catch (preservation issues) are also taken into account. When examining whether different supply chains in the Norwegian fish processing industry operate in accordance with characteristics central to SCM, two challenges emerge: The most severe is an operational one: To which degree are the supply chains in question managed according to SCM best practice principles, and how can this be determined? The second challenge arises from our addressing a collection of firms belonging to the same supply chain (as level of analysis), rather than individual firms. In most empirical SCM-studies, individual companies are studied (Vallet-Bellmunt et al., 2011). In addition, we need to translate the «wise words» of SCM into activities and practices observed in the supply chains in question. We do so by following Storey et al.’s (2006) «ideals». In Table 2, each SCM «ideal» is listed (see Table 1), with scores for the two supply chains (stockfish and whitefish fillets, respectively). The scores are based on our experience-based knowledge of each chain for each «ideal». An inspection of Table 2 reveals how the stockfish and whitefish fillet supply chains score against the ideally managed supply chain, noted earlier. 1 A seamless flow of goods can be interpreted as the smallest possible number of stops the product makes on its way from raw material to consumer (raw material warehousing, work in progress, stock of finished goods, etc.) and that the stops products necessarily have to make have the shortest possible duration. Obviously, from the descriptions of the whitefish fillet and stockfish supply chains, we see that the first is closer to a seamless flow than the latter, merely by looking at the production process and the lead time from raw material to finished product. 2 None of the chains is strictly pull-oriented, as production is not initiated by individual customer orders. Rather, both chains are supply—or push—oriented. However, the white-fish filleting supply chain is better configured (flexible, with respect to time constraints) to attend to customer demands. This is partly because companies in this chain are vertically integrated towards the suppliers. However, the ability of pulling through demand entirely in this chain is only possible to a limited degree: Despite having ownership in large trawlers, it is not possible for processors to entirely hedge against uncertainties regarding time of delivery, the size and quality of the fish and the composition of the catch. The manufacturing link of the chain has emerged as a good candidate for a decoupling point (cf. Lee, 2002; Mason-Jones et al., 2000); upstream of this, an efficient physical flow is impeded, or even impossible. 3/4 Information sharing and collaboration throughout the supply chain is better supported in the whitefish filleting supply chain than in the stockfish chain. This is not only because companies in this chain are relatively big and many of them are under joint ownership (as opposed to the small, stand-alone stockfish companies), but also because the level of vertical integration—both up- and downstream the value chain—is high. Upstream vertical integration, towards the fishing fleet, represents a potential for the manufacturer to obtain the raw materials he needs on a timelier basis. It also enables greater information sharing by way of a closer collaboration throughout the chain. 5 The whitefish fillet supply chain also makes more use of modern information technology than the stockfish chain. Suppliers (trawlers) and manufacturers collaborate in order to provide raw material for production, in a timely manner and—to some degree—the species and sizes needed for production. Automation of the production and distribution systems relies heavily on IT-enabled systems, tracking weight and temperature from vessel to retailers. IT has been implemented in the stock fish companies too, but to a lesser degree throughout the chain than between supply chain members and outside service providers (customs, sales organizations, etc.). 6 «Batch to sale» configuration of products and production is much higher in the whitefish filleting companies than the stockfish companies. The 400-gram fillet box found in supermarkets is identical to what is sent out from the filleting company. When purchasing stockfish in Italy for home cooking, it is rarely found in supermarkets and, if it is, it is hardly ever displayed on a shelf together with other staple products. Consequently, while product design and packing is essential for filleting companies, it is almost absent in the stockfish chain. 7 The organization of the whitefish filleting chain is much more customer responsive than that of the stockfish supply chain. Vertical (and horizontal) integration supports collaboration and information sharing in the fillet chain, where information on changes in enddemand is propagated backwards down the flow of goods. This enables a more customer-responsive effort from chain members. 8 When addressing whether the supply chain type is lean or agile (or a combination) the adequate point of departure is the type of good brought forward to the market. In our chosen setting, both products are mature products with limited elements of product innovation. Fillets are commodity-like: sold in high volumes, with modest profit margins and forwarded by a chain focusing on efficiency. In contrast, the stockfish supply chain mainly addresses niche-markets, where demand is relatively stable and profit margins largely depend on total quantity supplied and end-product quality (which is unobservable up front). The total production volume is endeavoured balanced with final demand. The main difference between the two products is perhaps the complexity of the end product. Fillets are relatively simple, and inherent product characteristics can in many instances be handled by technology instead of craftsmanship. The labour intensity involved in production has led to production relocation to sites in low-cost countries and a global division of labour. Stockfish, on the other hand, represents a more complex product. Even though the production technology is fairly simple, the outcome is both geographically determined (site specificity) and processes depend on tacit knowledge. The end product is affected by the climate during the lengthy processing period, and must satisfy different preferences in different regional markets, where product quality is finally established. There, products are customized, close to the retail outlets and the consumer. For fillets, similar products are offered to most markets, where product attributes are equal to all customers in multinational markets, except from the packaging, which is differentiated based on the language of the customers. In this respect, we deem the fillet supply chain to be relevant for leanness and efficient production, as described by Fisher (1997). Even though supply conditions are uncertain, companies in this segment have tried to overcome these problems by integrating towards the raw material source, but without the decoupling of chain participants, as recommended by Lee (2002). The stockfish supply chain cannot be characterized by either leanness or agility. 9/10 The stockfish supply chain scores better than the whitefish filleting chain on mass customization and market segmentation, partly because of product complexity and demand variability. The nature (and trade history) of this product has ensured that further processing takes place in proximity to the end customers, to ensure their demands are met. This is not necessarily done in order to be flexible and responsive to demand changes, but as a safe-guarding precaution, providing consumers with what they want, when they want it. The grading of the end product often directs it to distinct geographical Italian markets where the various qualities are most preferred by customers. The products are thus not, in fact, customized, but the market is segmented. Additionally, in order to ensure pipeline efficiency, a seamless flow is preferably supported by a batch-to-sale configuration of goods, information sharing and collaboration among supply chain participants. If the flow of goods throughout the chain is coupled with state-of-the-art information systems «…the transportation system becomes the warehouse» (Tan et al., 1998: 4), and «seamlessness» is more easily attained. From our presentation of the supply chains, it is obvious that the flow of goods to the market from the whitefish fillet chain is closer to fulfilling these ideal SCM requirements than that from the stockfish supply chain. The average company size in the whitefish filleting chain further contributes to fulfilling the ideal SCM requirements, and the fact that several of them belong to one manufacturing concern, eases an overall supply chain strategy and the use of tools to enable better information, coordination, control and organization throughout the supply chain (Cigolini et al., 2004). Company size also ensures an ability to successfully implement complex logistical tools within the whitefish-filleting segment (like JIT, TQM and R&D-efforts with respect to optimal packaging and batch configuration), which, for small companies in the stockfish branch, might be deemed superfluous or redundant utilization of managerial resources (Arend & Wisner, 2005; Bates & Slack, 1998). All in all, inspection of Table 2 reveals that the whitefish filleting branch is the one most in accordance with concurrent SCM principles – however, not a ‘perfect match’. Our mapping shows that the whitefish filleting supply chain corresponds better with the «ideal» SCM characteristics in items 1 to 7 in Table 2, than does the stockfish chain. One reason might be the atypical industrialization process this segment has undergone, partly due to its political legitimacy, where the utilization of modern technology has been central. Also, of the two supply chains addressed here, whitefish filleting has suffered the most from increased competitive pressure in recent decades. The motivations for implementing SCM are many. Short-term objectives include increased productivity and reduced inventories and lead times. On a longer term, improved customer satisfaction, competitive advantage, and increased profitability (for all chain members) are the objectives (Li et al., 2006; Tan et al., 1998). Therefore, one promising departure for measuring the success of SCM implementation and adherence to SCM principles is looking at the organizational performance of chain members. Despite the great focus on performance effects from SCM, few studies have examined performance effects empirically, especially when it comes to the impact of SCM on company profitability. One reason for this dearth is that no consensus exists for how to measure and monitor supply chain performance. Otto & Kotzab (2003) suggested two possibilities: Either measure whether the company profits from organizing its operations in accordance with SCM principles, or measure performance against a specifically defined goal for which SCM is assumed to be a useful measure (like increasing supply security). We address profitability of SCM outcomes in line with Li et al., (2006), who found that SCM practices positively influence both the level of competitive advantage and organizational performance. Vickery et al. (1999) found that volume flexibility positively correlated with financial performance (ROI and ROS) in the highly cyclical furniture industry. Finally, Tan et al. (1998) applied performance indicators (market share, return on assets, etc.) of individual manufacturing companies as dependent variables explained by the company’s customer relations and sourcing practices, and found a strong correlation with corporate performance. Average profitability in the fishing industry (i.e. the fishing fleet) has exceeded that of the fish processing industry since 1996. This is not surprising, as fishing involves the harvesting of a renewable resource, which, if managed properly, should achieve economic rent. Parallel to the multiple sourcing of fish processing companies, fishing vessels have multiple buyers for their catch, depending on price, species caught, catch area and season. Hence, the supplier base of a processing company can consist of numerous vessels, just as the circle of customers. It is natural to measure supply chain profitability at the processing stage, as this is where the main transformation process takes place, «sandwiched» as it is between suppliers and customers. The two different segments of the processing industry exhibit different levels of profitability. In Figure 1, the annually weighted average of return on investments and profit margin (ROI and PM) is displayed for whitefish filleting and stockfish processors from 1995 to 2009. While profit margins illustrate how much of the sales end up as profit to owners (and tax), return on investment allows for a measuring of profit against total productive capital employed. 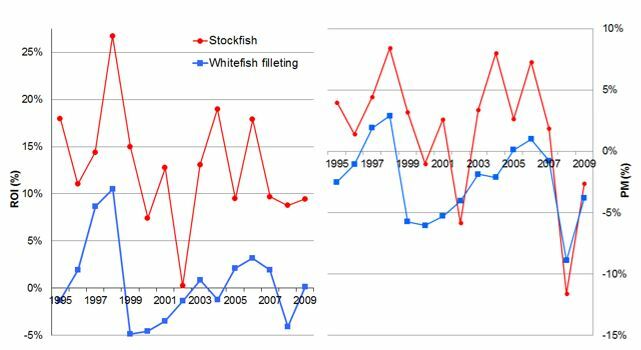 Figure 1 shows that the stockfish processors have enjoyed better profitability than the whitefish filleting industry, both in terms of ROI and PM, in the period. Large inter-year variations take place, but stockfish companies have clearly, on average, generated better results than whitefish filleting companies. As can also be seen, the financial crisis in 2008/2009 hit this industry hard. Together with exchange rate unrest, it hit the stockfish supply chain the hardest, because the main export country (Italy) belongs to the group of EU-countries struggling the most in the wake of the financial crisis. Still, the finding is surprising, as it, from an SCM perspective, contradicts conventional recommendations. We demonstrated above that the organization of the stockfish supply chain is inferior to that of whitefish filleting, as measured against the «ideals» from SCM. Here, we find the supply chain best in accordance with SCM principles also to perform the worst. Below, we shed some light on the paradox of SCM principle adherence and the lack of profitability effects therefrom. Our results shows that prevailing SCM principles are more commonly implemented in the whitefish filleting supply chain than in the stockfish chain. Contradictory to literature prescriptions, our findings indicate that the stockfish supply chain displays greater long-term financial performance (i.e. competitive advantage) than the whitefish filleting supply chain, despite the fact that it to a much lesser degree conforms with prescriptions of «ideal» SCM. To our knowledge, the only SCM research undertaken in a similar setting, is Hameri & Pálsson’s (2003) study from the Icelandic fisheries industry ‘9’ . They take a wider approach, where they map the situation of the Icelandic seafood supply chain and point to its single largest challenge, which is to absorb raw material flow variations upstream, as — after all — the demand for fresh, salted and frozen fish is relatively stable. According to Chen et al. (2004), supply management contributes to enhanced financial performance for the buying company, but is also important in fostering supply management capabilities, which may generate durable strategic advantages. In our setting, the reasons why SCM compliance does not coincide with durable top-class financial performance can be many. One is that gaining and sustaining competitive advantages require more than a well-designed and well-managed supply chain. Company size might also play a role. Here, we find the largest companies, both in terms of turnover and the number of employees, within the whitefish-filleting branch. According to Li et al. (2006), large organizations require more effective management of their supply chains, as their supply chain networks are more complex than those of their smaller competitors. For a supply chain designed for scale economies (hence, low unit costs), it might be unfair to be measured against a flexible chain with seasonal production, serving a niche market, even though the supply side challenges are similar. Small companies in this uncertain supply side environment might have benefitted from capabilities emphasising flexibility, which have been harder to implement in larger organizations with higher capacities (minimum efficient scale) and corresponding cost penalties (Dreyer & Grønhaug, 2004; Vickery et al., 1999). Consequently, larger companies with specialized equipment and a strategy to serve the market in a continuous manner are heavily penalized if supplies fail to appear, and production is temporarily shut down, because their fixed costs are relatively high. The crucial issue here is the supply side uncertainty, and, as noted by Ottesen & Grønhaug (2003), managers in the Norwegian fish processing industry devote most of their attention towards one specific part of the business environment—the input market. Hence, the uncertainty created by nature and/or the strategic acts of the processing companies’ counterpart in the raw material market, is the single most resourcedemanding feature for managers in this industry. Product characteristics and consumer demand also shed light on performance differences. Globalization, competitive pressure and market fragmentation have affected whitefish filleting companies much more severely than the stockfish supply chain. With its commodity-like product exposed to competition from other species and from other nations, the whitefish filleting branch is ‘stuck in the middle’ with falling margins, due to increased competitive pressure in both input and output markets. Onboard freezing and subsequent warehousing opened up the raw material market, which eroded localization advantages. Due to this, Norwegian whitefish fillet producers found themselves in competition with Chinese companies ’10’ , producing the «same» product at lower labour costs, but also with less valuable species like Alaska pollock, hake, pangasius, tilapia and blue whiting. Structural changes in the supply chain, with increased bargaining leverage at the retailer stage, have also altered the business landscape considerably. The dynamic and rapid changes in the competitive environment led to eroding advantages for whitefish fillet processors (Bendiksen & Dreyer, 2003; Sogn-Grundvåg et al., 2007). Even though conditions were in place for near ideal SCM in this segment, the possibilities for profitability levels above average became limited as time passed. Norwegian stockfish has one major market (Italy); few substitutes exist, and processors are to a large degree insulated from the competitive pressure affecting whitefish filleting companies. Instead of trying to control the uncertain supply environment in which fish processing companies are embedded, history and tradition have taught stockfish producers to adapt to the inherent uncertainty, and enabled them to respond in a flexible manner to supply uncertainty, since demand conditions have appeared to be relatively stable. For stockfish producers, weather and climate unpredictability also exacerbates uncertainty within the manufacturing process. In fact, this SC’s adherence to market segmentation and mass customization principles is by and large dictated by biology and weather conditions. Segmentation is mainly geographical, based on consumer preferences. Processors, however, have very little influence on the end product. Once the fish is on the rack, weather does its trick and the grader later determines quality according to his best ability. Similarly, the element of mass customization follows the same pattern. This supply chain has also kept their localization advantage despite vast structural changes in the fishing fleet, due to their demand for large sized cod, which is more or less guaranteed as long as the fish continues to migrate to Lofoten to spawn. Furthermore, the demand side for stockfish is stable and Norwegian processors are, by and large, shielded from foreign competitors for this functional product. The product characteristics (with respect to shelf life and transport requirements) enables warehousing practically anywhere downstream the supply chain, which should favour SCM practices among chain participants. Such practices are, however, not implemented. One reason for this is that countering uncertainty (i.e. implementing SCM) is demanding on both time and resources, and might produce a great deal of hassle (Mason-Jones & Towill, 2000) — a cost small-scale stockfish producers are unwilling to bear all the while demand uncertainty is handled satisfactorily. Supply side conditions are the largest obstacle to implementation of effective SCM practices in our setting, but in literature, this side of the coin is often neglected as a problem for the supply chain. For instance, Mason-Jones & Towill (2000: 45) ascertain that «… the supply side and manufacturing process segments are essentially under the direct control of the business and may be tackled using principles such as lean thinking». Furthermore, Childerhouse & Towill (2004: 586) assert that «… supplier interface uncertainty results from non-compliance with our orders». In the fish processing industry, this is clearly not the case. Orders for fish are only exceptionally placed, and the supplier interface is either near faceless, as in the case with frozen fish or pelagic fish auctions, or highly relational, as in the traditional long-term relationship between colocalized vessel owners and processors. «…customers’ needs, while always important, are subordinated to the decisions and needs of the supply source» (p. 219). This corresponds with Ottesen & Grønhaug’s (2003) findings from the Norwegian fish processing industry, where the greatest attention of managers was directed towards the supply source. Hull’s (2005) treatment of supply-driven chains are categorized in four major themes, which all suit our cases. First, supply initiates the product flow, and operation interruptions must be resolved quickly to avoid significant delay penalties. Second, ‘resilience’ is needed to ensure the flow of supply. Alternative markets should be available if one fails, or price adjustments should be made to encourage (or discourage) demand. Third, products are like commodities, because they are sold on price, typically in multiple markets, geared towards the most profitable. Finally, customer services are mainly guided by price. In supply-driven chains, the bullwhip effect is reversed, based as it is on the fear of demand limitations, whereas in demand-driven chains it is based on the fear of supply limitations. In demand-driven supply chains, information sharing between chain participants is assumed to reduce the bullwhip effect. In supply-driven chains, however, information sharing might increase the bullwhip effect, because customers might demand price reductions if they gain knowledge of supply increases, reduced primary prices or operational efficiencies. This situation could occur in our setting if, for instance, quotas or landings increase, exvessel prices fall or technological advantages take place in the manufacturing process. This situation occurred during the international financial crisis in 2008/2009, where a severe depreciation of the Icelandic currency, among other things, worsened terms of trade for Norwegian fish processors. As a consequence, Norwegian ex-vessel prices for cod fell by 30 percent during the first half of 2009, while stockfish prices (to Italy) fell by 40 percent from December 2008 to December 2009. Export prices for frozen cod fillets, which were more robust in terms of the number of available markets, fell by 20 percent during that year. As a consequence, the profitability in the whitefish filleting supply chain was less affected than the stockfish supply chains in 2008/2009, as shown in Figure 1. For stockfish, industrial experience-based knowledge dictates that if production and supply to the Italian market exceed approximately 3,000 tonnes annually, prices will fall, leaving everyone worse off. With more accessible information, for instance by web-based solutions on ex-vessel prices and quantities, Italian importers are equipped with much better arguments in haggling over contractual terms and conditions. As underlined by van der Vorst et al. (1998), the inherent uncertainty facing managers in this industry can only marginally be remedied by SCM. Hence, textbook ideals on SCM implementation must be adapted to the actual business environment by taking the contextual embeddedness into consideration. In our setting, uncertainty favours SCM, but SCM alone is inadequate to create and defend competitive advantages. Ellram (1991) claims that vertical integration can be seen as an alternative to SCM, and Kouvelis & Milner (2002) assert that greater supply uncertainty increases the need for vertical integration. Here, the whitefish filleting sector has undertaken upstream vertical integration. However, this strategic measure does not fully insulate the companies from the unpredictability of nature (Hermansen et al., 2012). Instead, due to the seasonality of fisheries, fish processing companies invest in production capacities to be able to handle landing peaks. Despite efforts to forward fish to areas with less supply, or to sell the fish unprocessed, the result is nevertheless a substantial overcapacity in fish processing, leading to excess catch demand and ex-vessel price press. Figure 2 shows the monthly catch volumes of cod in the northernmost Norwegian sales organization (handling 85 percent of total Norwegian cod sales), together with ex-vessel cod prices (left axis) and export prices for stockfish and frozen cod fillets (right axis) for the period January 2008 to December 2011. 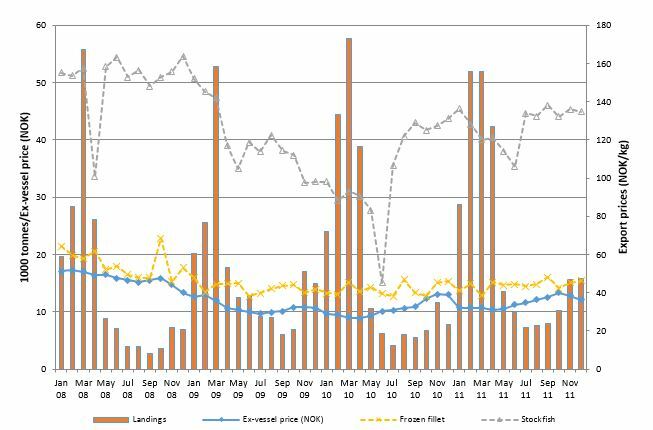 Figure 2 Monthly landings (bars) and ex-vessel prices (blue line) for cod (left axis: in thousand tonnes and NOK) and export prices (dotted lines on right axis) for stockfish (green) and frozen fillets (purple). January 2008–December 2011. Source: Norwegian Fishermen’s Sales Organization and Norway Seafood Council. Figure 2 shows the vast seasonal volume differences in cod landings, to which processors must adapt. Stockfish producers purchase fish during the peak months (February-March), whereas whitefish filleting companies might face serious obstacles when trying to utilize production capacity during the summer months. Fillet export prices correspond more to the trend of the ex-vessel price than what is the case for stockfish export prices. Price levels for the two also reflect the ratio between round/live weight and product weight, which on average is 3.25 and 6.53 for fillet and stockfish from cod, respectively. The reduction in stockfish export prices is more severe compared to ex-vessel prices after November 2008. What makes this dramatic for stockfish producers is the time lag between purchase and sale, and the work-in-process inventory. Since fish is purchased in the winter, processed throughout the spring and summer and then sold in the autumn, the 2009 season was quite challenging for stockfish producers, who had purchased fish at prices that were hard to redeem in the market later that year. Stockfish export prices appear to have largely recovered in 2010. For whitefish filleting companies, operating under much shorter lead times, break-even prices seemed much more feasible, with greater flexibility to exploit the margins between input and output prices. It should be noted that behind the average prices and profit measures we operate with here, a vast variation exist, implying that we find firms – in both supply chains – that are better off than others. Recommending a single, unique and blissful SCM strategy for the Norwegian fish processing industry would likely leave more companies worse than better off. Each individual company is probably the best to judge how it should satisfy its customers — within the confines of the environment it operates. Blissful strategies, created and followed by Toyota, Dell, Wall-Mart and other powerful companies, are not necessarily easy transformed into feasible, successful strategies for SMEs. Nevertheless, lessons that can help the company make well-informed decisions can be learnt from logistics, management, economics and sociology — without trying to force a scheme upon the company. There is, however, no doubt that a proper focus on managing every step of the supply chain can turn out to be more effective than the strategy hitherto most often adopted in this industry, namely upstream vertical integration (Isaksen et al., 2004). Two main challenges remain: to balance the needs of customers with the varying flow of inputs from suppliers, and to align the conflicting goals of the supplier and processor regarding fish prices. This strategic window can be favourably exploited by focusing on the core competencies companies possess, mainly related to processing know-how and detailed product market knowledge. This is valid for producers of both stockfish and whitefish fillets, and a promising point of departure could be an active supplyside partitioning (Erevelles & Stevenson, 2006) and strategic supplier segmentation (Pressey et al., 2009), where the company differentiate between its ‘arms-length’ suppliers and ‘partners’ (Dyer et al., 1998). Profitability variations can be explained by many different factors. The competitive power and position of companies are often linked to either a good cost position and/or a superior value position. A company’s competitive advantage, relative to its competitors, can be the result of the company’s ability to enjoy a collection of resources that enables it to market products that are either perceived by customers to be of higher value and/or produced at lower costs (Hunt & Morgan, 1995). In our context, stockfish producers have obviously enjoyed a greater competitive advantage than filleting companies, but SCM can only to a limited degree explain this difference. The advantage of the stockfish supply chain seems to stem from their unique product with relative few competitors — a unique regional brand feature similar to those of Cognac, Parmesan cheese or Iberian ham: The Lofoten stockfish. In this study, we have not tried to explain the significant profitability variations among stockfish companies. An important finding, however, is that the implementation of SCM in our setting has to be adapted to the distinctive characteristics that this industry is faced with in their specific context. An indepth examination of how the stockfish companies individually handle SCM tasks would therefore be an interesting continuation of this study. The level of analysis should be changed, from industry to company (or rather single supply chain), because SCM in its nature is an activity undertaken by (groups of) companies, not industries. Similarly, in the whitefish filleting supply chain, a study could be carried out in order to isolate the effect of whether a varying degree of SCM implementation among companies can explain the variations in profitability. In this perspective, a more thorough analysis of individual successful companies’ implementation of SCM strategies could prove fruitful, to point to profitable effects therefrom. By adopting the idea that SCM must be adapted to the challenges producers are facing, changes in the context and business climate can alter the value and significance of SCM. A technological development in the stockfish chain, enabling a cost-effective and quality-enhancing artificial drying of cod (even frozen at sea), could potentially render the advantage of Lofoten producers redundant and erode profitability in this chain. Such a scenario will probably make SCM much more important than under today’s processing technology. For policy makers, any step to improve information sharing in the chain, enabling the potential for traceability and, thus, increased customer satisfaction, would support the chain’s competitive power and improve SCM. Further, to keep and protect Norwegian seafood producers’ competitiveness on the global marketplace it is essential that authorities manage waters and fish stocks in a sustainable manner, so that products can be marketed as healthy, and «originating from cold, clear Norwegian waters». The practical implication from this study is that company managers in this industry need to develop contextual knowledge and take into account the distinct characteristics in the industry as well as the products they produce and offer, when implementing SCM. Success will depend upon a best possible utilization of and adaptation to the resources deployable for the supply chain. Araujo, L., A. Dubois & L.-E. Gadde (1999). Managing interfaces with suppliers. Industrial Marketing Management, 28:5, pp. 497–506. Arend, R.J. & J.D. Wisner (2005). Small business and supply chain management: Is there a fit. Journal of Business Venturing, 20:3, pp. 403–436. Barney, J.B. (1986). Strategic factor markets: expectations, luck and business strategy. Management Science, 32:10, pp. 1231–1241. Barney, J.B. (2002). Gaining and Sustaining Competitive Advantages. 2 edn., Upper Saddle River, NJ: Prentice Hall International). Bates, H. & N. Slack (1998). What happens when the supply chain manages you? A knowledge based response. European Journal of Purchasing & Supply Management, 4:1, pp. 63–72. Bendiksen, B.I. (2010). Driftsundersøkelsen i fiskeindustrien 2009. [Annual profitability study for the fish processing industry] (in Norwegian). Report No. 45, Nofima, Tromsø, Norway. Bendiksen, B.I. & B. Dreyer (2003). Technological changes – the impact on the raw material flow and production. European Journal of Operational Research, 144:2, pp. 237–246. Berge, G. (1996). Tørrfisk [Stockfish] (in Norwegian). Stamsund: Orkana Forlag. Burgess, G.H., C. Cuttings, J. Lovern & J.J. Waterman (1967). Fish handling & processing. New York: Chemical Publ. Co.
Burt, D.N. & R.L. Pinkerton (2003). A Purchasing Manager’s Guide to Strategic, Proactive Procurement. New York: AMACOM Books. Chandra, C. & S. Kumar (2000). Supply chain management in theory and practice: a passing fad or a fundamental change? Industrial Management & Data Systems, 100:3, pp. 100–114. Chen, I.J., A. Paulraj & A.A. Lado (2004). Strategic purchasing, supply management, and firm performance. Journal of Operations Management. 22:5, pp. 505–523. Childerhouse, P. & D.R. Towill (2004). Reducing uncertainty in European supply chains. Journal of Manufacturing Technology Management, 15:7, pp. 585–598. Christopher, M. (2000). The agile supply chain. Competing in volatile markets. Industrial Marketing Management, 29:1, pp. 37–44. Christopher, M. (2005). Logistics and Supply Chain Management. 3rd edn., Harlow: Prentice Hall. Cigolini, R., M. Cozzi & M. Perona (2004). A new framework for supply chain management: Conceptual model and empirical test. International Journal of Operations & Production Management, 24:1, pp. 7–41. Coase, R.H. (1937). The nature of the firm, Economica, 4: 6, pp. 386–405. Coyle, J.J., E.J. Bardi & C.J Langley Jr. (2003). The Management of Business Logistics. A Supply Chain Perspective. 7th edn., Mason: South-Western. Davis, T. (1993). Effective supply chain management. Sloan Management Review, 34:4, pp. 35–46. Dreyer, B. & K. Grønhaug (2004). Uncertainty, flexibility, and sustained competitive advantages. Journal of Business Research, 57:5, pp. 484–494. Dulsrud, A. & K. Grønhaug (2007). Is friendship consistent whith competitive market exchange? A microsociological analysis of the fish exportimport business. Acta Sociologica, 50:1, pp. 7-19. Dyer, J.H. & H. Singh (1998). The relational view: Cooperative strategy and sources of interorganizational competitive advantage. Academy of Management Review, 23:4, pp. 660–679. Dyer, J.H., D.S. Cho & W. Chu (1998). Strategic supplier segmentation: The next «best practice» in supply chain management. California Management Review, 40:2, pp. 57–77. Ellram, L.M. (1991). Supply chain management. The industrial organisation perspective, International Journal of Physical Distribution & Logistics Management, 21:1, pp. 13–22. Erevelles, S. & T.H. Stevenson (2006). Enhancing the business-to-business supply chain: Insights from partitioning the supply-side. Industrial Marketing Management, 35:4, pp. 481–492. Fisher, M.L. (1997). What is the right supply chain for your product? Harvard Business Review, 75:2, pp. 105–16. Gadde, L.-E. & H. Håkansson . Supply Network Strategies. Chichester: Wiley. Galbraith, J.R. (1973). Designing complex organizations. Reading, Mass. : Addison-Wesley. Georgiadis, P., D. Vlachos & E. Iakovou (2005). A system dynamics modeling framework for the strategic supply chain management of food chains. Journal of Food Engineering, 70:2, pp. 351–64. Hameri, A.-P. & J. Pálsson (2003). Supply chain management in the fishing industry: The case of Iceland’, International Journal of Logistics: Research and Applications, 6:3, pp. 137–49. Harrigan, K.R (1983). A framework for looking at vertical integration. Journal of Business Strategy, 3:3, pp. 30–37. Haugland, S.A. & K. Grønhaug (1996). Cooperative relationships in competitive markets. Journal of Socio-Economics, 25:3, pp. 359–71. Hermansen, Ø., J.R. Isaksen & B. Dreyer (2012). Challenging spatial and seasonal distributions of fish landings. Experiences from vertically integrated trawlers and delivery obligations in Norway. Marine Policy, 36:1, pp. 206–213. Hobbs, J.E. & L.M. Young (2000). Closer vertical coordination in agri-food supply chains: a conceptual framework and some preliminary evidence. Supply Chain Management: An International Journal, 5:3, pp. 131–143. Holter, A.R., D.B. Grant, J. Ritchie & N. Shaw (2008). A framework for purchasing transport services in small and medium size enterprises, International Journal of Physical Distribution & Logistics Management, 38:1, pp. 21–38. Hull, B.Z. (2005). Are supply (driven) chains forgotten? The International Journal of Logistics Management, 16:2, pp. 218–236. Hunt, S.D. & R.M. Morgan (1995). The comparative advantage theory of competition. Journal of Marketing, 59:2, pp. 1–15. Hutt, M.D. & T.W. Speh (2004). Business Marketing Management: Strategic View of Industrial and Organizational Markets. 8th edn. ; Mason, Ohio: South-Western. Isaksen, J.R., B. Dreyer & K. Grønhaug (2004). How to secure critical supply? Market exchange or vertical integration.In Challenging Boundaries with Logistics – Proceedings H. Aronsson (ed. ), Linköping: University of Linköping, pp. 307–322. Ketchen Jr., D.J. & L.C. Giunipero (2004). The intersection of strategic management and supply chain management. Industrial Marketing Management, 33:1, pp. 51–56. Kopczak, L.R. & M.E. Johnson (2003). The supply-chain management effect. Sloan Management Review, 44:3, pp. 27–34. Kouvelis, P. & J.M. Milner (2002). Supply chain capacity and outsourcing decisions: The dynamic interplay of demand and supply uncertainty. IIE Transactions, 34:8, pp. 717–728. Lambert, D.M. & M. Cooper (2000). Issues in supply chain management. Industrial Marketing Management, 29:1, pp. 65–83. Langlois, R.N. (1997). Transactioncost economics in real time. In Resources, firms and strategies, Nicolai J. Foss (ed. ), Oxford: Oxford University PRess, pp. 286–305. Lee, H.L. (2002). Aligning supply chain strategies with product uncertainties. California Management Review, 4:3, pp. 105–119. Li, S., Ragu-Nathan, T.S. Ragu-Nathan & S. Subba Rao et al. (2006). The impact of supply chain management practices on competitive advantage and organizational performance, Omega, 34:2, pp. 107–124. Lynum, L. (2005). Videreforedling av fisk [Fish Processing] (in Norwegian). Trondheim: Tapir. Mahoney, J.T. (1992). The choice of organizational form: Vertical financial ownership versus other methods of vertical integration. Strategic Management Journal, 13:8, pp. 559–584. Mason-Jones, R. & D.R. Towill (2000). Coping with uncertainty: Reducing «bullwhip» behaviour in global supply chains. Supply Chain Forum: An International Journal, 1:1, pp. 40–45. Mason-Jones, R., B. Naylor & D.R. Towill (2000). Engineering the leagile supply chain. International Journal of Agile Management Systems, 2:1, pp. 54–61. Mentzer, J.T., W. DeWitt, J.S. Keebler, S. Min, N.W. Nix, C.D. Smith & Z.G. Zacharia et al. (2001). Defining supply chain management. Journal of Business Logistics, 22:2, pp. 1–25. New, S.J. (1997). The scope of supply chain management research. Supply Chain Management, 2:1, pp. 15–22. Olhager, J., E. Selldin & J. Wikner (2006). Decoupling the value chain. International Journal of Value Chain Management, 1:1, pp. 19–32. Ottesen, G.G. & K. Grønhaug (2002). Market orientation and uncertain supply in upstream markets: an exploratory study. European Journal of Purchasing & Supply Management, 8:4, pp. 209–219. Ottesen, G.G. & K. Grønhaug (2003). Primary uncertainty in the seafood industry: an exploratory study of how processing firms cope. Marine Resource Economics, 18:4, pp. 363–71. Otto, A. & H. Kotzab (2003). Does supply chain management really pay? Six perspectives to measure the performance of managing a supply chain. European Journal of Operational Research, 144:2, pp. 306–320. Paulraj, A. & I.J. Chen (2007). Environmental uncertainty and strategic supply management: A resource dependence perspective and performance implications. The Journal of Supply Chain Management: A Global Review of Purchasing and Supply. 43:3, pp. 29–42. Pedersen, T. (1989). Prosesser og produkter i norsk fiskeindustri [Products and processes in the Norwegian fish processing industry] (in Norwegian), 1&2; Oslo: Universitetsforlaget. Petersen, K.J., R.B. Handfield & G.L. Ragatz (2005). Supplier integration into new product development: coordinating product, process and supply chain design. Journal of Operations Management, 23:3–4, pp. 371–388. Porter, M.E. (1985). Competitive Advantage. Creating and Sustaining Superior Performance. New York: The Free Press. Pressey, A.D., H.M. Winklhofer & N.X. Tzokas (2009). Purchasing practices in small- to medium-sized enterprises: An examination of strategic purchasing adoption, supplier evaluation and supplier capabilities. Journal of Purchasing and Supply Management, 15:4, pp. 214–226. Rajola, F. (2003). Customer relationship management. Organizational and technological perspectives. Berlin: Springer-Verlag. Sheperd, W.G. (1997). The Economics of Industrial Organization (4 edn.). Prospect Heights, Illinois: Waveland Press. Sogn-Grundvåg, G., K. Grønhaug, L.T. Lorentzen, B.-I. Bendiksen & A. Gilmore (2007). Responding to eroding competitive advantages: observations from the Norwegian seafood industry. The Marketing Review, 7:3, pp. 235–46. Spekman, R., J.W. Kamauff Jr. & N. Myhr (1998). An empirical investigation into supply chain management: a perspective on partnerships. Supply Chain Management, 3:2, pp. 53–67. Storey, J., C. Emberson, J. Godsell & A. Harrison (2006). Supply chain management: Theory, practice and future challenges. International Journal of Operations & Production Management, 26:7, pp. 754–74. Sutcliffe, K.M. & A. Zaheer (1998). Uncertainty in the transaction environment: an empirical test. Strategic Management Journal, 19:1, pp. 1–23. Tan, K.C, V.R.Kannan & R.B. Handfield (1998). Supply chain management: Supplier performance and firm performance. International Journal of Purchasing and Materials Management, 34:3, pp. 2–9. Taylor, D.H. & A. Fearne (2006). Towards av framework for improvement in the management of demand in agri-food supply chains. Supply Chain Management: An International Journal, 11:5, pp. 379–384. Teece, D.J. (1984). Economic analysis and strategic management. California Management Review, 26:3, pp. 87–110. Vallet-Bellmunt, T., M.T. Martínez-Fernández & J. Capó-Vicedo (2011). Supply chain management: A multidisciplinary content analysis of vertical relations between companies, 1997–2006, Industrial Marketing Management, 40:8, pp. 1347–1367. Van der Vorst, J.G.A.J., A.J.M. Beulens, W. de Wit & P. van Beek (1998). Supply chain management in food chains: improving performance by reducing uncertainty. International Transactions in Operational Research, 5:6, pp. 487–499. Van der Vorst, J.G.A.J. & A.J.M. Beulens (2002). Identifying sources of uncertainty to generate supply chain redesign strategies. International Journal of Physical Distribution & Logistics Management, 32: 6, pp. 409–430. Van der Vorst, J.G.A.J., S.J. van Dijk & A.J.M. Beulens (2001). Supply chain design in the food industry. International Journal of Logistics Management, 12:2, pp. 73–85. Vickery, S., R. Calantone & C. Dröge (1999). Supply chain flexibility: An empirical study. The Journal of Supply Chain Management: A Global Review of Purchasing and Supply, 35:3, pp. 16–24. Waters, D. (2007). Global Logistics. New Directions in Supply Chain Management (5th edn.). London: Kogan Page. Wernerfelt, B. (1984). A resource-based view of the firm. Strategic Management Journal, 5:2, pp. 171–180. Williamson, O.E. (1983). Organizational innovation: The transaction-cost approach. In Entrepeneurship, J. Ronen (ed. ), Lexington, Mass. : Lexington Books, pp. 101–133. The ideals presented are collected from Storey et al. (2006) but correspond to other treatments of SCM (best) practice. See for instance Christopher’s (2005: 288-92)“7 critical business transformations”; from supplier to customer centric; from push to pull; from inventory to information; from transactions to relationships; from “trucks-to-shed” to “end-to-end” pipeline management; from functions to processes; and from stand-alone competition to network rivalry. Also Coyle et al.’s (2003: 22-25) “SCM Characteristics” are parallel to these (i.e. inventory visibility, pull systems, landed costs (at the end of the pipeline), real-time infor-mation, customer service and supply chain collaboration). Ellram (1991) also claims that vertical integration can be seen as an alternative to SCM, while Kouvelis and Milner (2002) assert that greater supply uncertainty increases the need for vertical integration. On the other hand, Christopher (2005) argues that SCM is not the same as vertical integration; it was once thought to be a desirable strategy but with increased focus on ‘core business’, other activities are ‘outsourced’ and procured outside. In the 1990’s, annual Norwegian cod quotas (and catch) varied between 113,000 and 399,000 tons. Even in the period 1999–2011, where a specific quota stabilization rule was included in the management plan, the standard deviation on annual cod quotas was 18 percent. For annual slaughter weight of cattle, sheep and pork in Norway in the same period, the standard deviation was 4, 4 and 8 percent respectively. In 2004, six dominating stockfish producers established a mutual export company, serving as a price guarantor for processors and to “speak with one voice” towards Italian importers. The cooperation was suspended in 2009, since members did not stick to agreed minimum prices; the curse of the cartel. In later years, the industry’s emphasis has been on fresh, rather than frozen, fillets. Earlier, the whole fillet went to the 400 grams box. Today, however, this product is so price strained, due to foreign and offshore competition, that every measure is taken to direct the raw material to its best paid option. Now, the fillet is split into three products: loins, tails and belly flaps. The loin (the prime cut) is most important and best paid. Cod loins, from fish no older than four days, is marketed fresh, while older loins go to wet-pack or vacuum packed frozen products. Hence, the 400 grams box of frozen fillets is now a by-product (Sogn-Grundvåg et al. 2007). Otherwise, the closest to the fishing industry one comes in SCM literature, is the following analogy, given by a manager who explains how he manages his business relationship with suppliers (in Petersen et al. 2005: 372): “Suppliers are like fish in the ocean. We (the buyers) are the fishermen. (…) There are several problems associated with fishing: How do we know we are using the right bait? How do we know the right kinds of fish are in the water? Most importantly; when we catch a fish, how do we know whether it is the right fish, and whether we should keep it or throw it back in the water? Finally, how do we know the fish will follow through with its commitments if we decide to keep it?” Needless to say; this is a metaphor, far from the reality that Norwegian fish processing companies operate in. The erection of cold storage plants and auctions was a blessing not only for the fishing fleet. Some branches grasped the opportunity of the detachment of catch areas and landing location on, and processing localization. Hence, cold storage plants and has constituted an effective decoupling point for some industry participants.